Atlanta, GA- Relix.com presents the exclusive premiere of the Devon Allman video, “Stop Draggin’ My Heart Around”, from his Ruf Records release, Turquoise, on Monday, April 15. A five day exclusive run will coincide with him and his band, Royal Southern Brotherhood and their appearance at the Wanee Festival on April 18th, ending on Friday, April 19th. This rock classic is a duet with label mate and Blues Music Award winner, Samantha Fish, whose vocals are sassy and smart; melding with Devon’s strong rich voice. Directed by Mark Bergeron with Nate Tape as Director of Photography and Arthur Reed as producer, the three were able to use the city of New Orleans and all its romance to give the desperate song some vivid color. For the video shoot, they took to the streets of New Orleans, where the “romantic couple” are walking the streets trying to find each other. They filmed it at various points, the famous Chickie Wah Wah’s music club, a little streetcar riding and cameos were made by Royal Southern Brotherhood members, Cyril Neville and Charlie Wooton. Turquoise was released on February 12 on Ruf Records to glowing reviews from USA TODAY, Texas Music Magazine, Hittin’ the Note, and of course, Relix. “These songs are very special to me,” says Allman. “It’s part ‘dusty road driving music’ and part ‘tropical getaway’ music. These are the stories, feelings and reflections from my last couple of decades of forging my musical path.” The CD was produced and mixed by multi-Grammy winner Jim Gaines and recorded at his Bessie Blue Studios in Stantonville, Tennessee, as well as at Ardent Studios in Memphis. Ruf Records is distributed by Allegro worldwide. 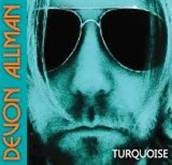 So tune in to Relix.com come Monday for the Premiere of Devon Allman “Stop Draggin’ My Heart Around”!